Travel to Brazil and Experience the Amazon Jungle at the Uacari Jungle Lodge. 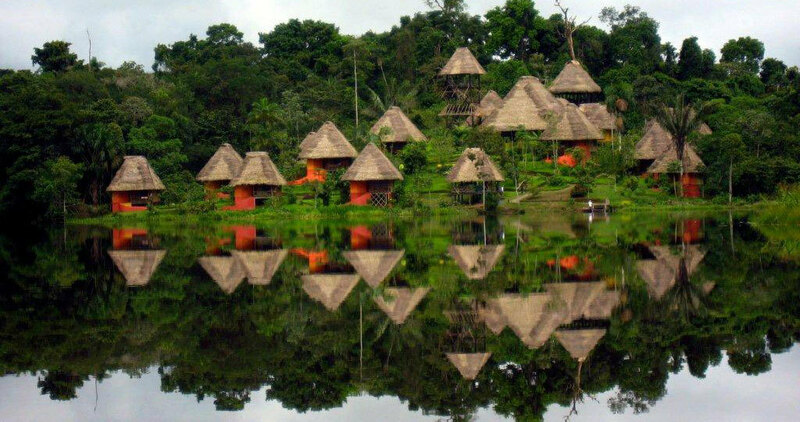 It is a Sustainable Tourism Ecolodge, which provides educational and economical support to several small communities in the surrounding area. Most employees are Caboclos or local natives who are learning a specific trade. Services offered at the Uacari Jungle Lodge are designed to allow the Caboclos to improve their lives while offering visitors a more natural environment. Therefore, some services offered may not be at international hotel standards. However, character makes up for it. The Uacari Jungle Lodge counts 5 floating bungalows that can accommodate maximum twenty persons. A central floating area, a natural swimming pool, a kitchen, a restaurant, a bar, a video room and a library complete this incredible structure. As a sustainable project, the lodge enjoys solar power. During your stay you will see the flooded forest, an abundance of birds, monkeys, black caiman, and other wildlife. The lodge also offers trips to a local river village in order to interact and get to know the Amazonian population and their way of life. We recommend you do not miss the tour to Lake Mamiraua where you will see the pink dolphins jumping, silver fish literally jumping into your boat, and the hundreds of caimans, up to 5 ft long. The lodge has a system of fourteen trails in the forest. Developed in a flat terrain and with 3km in average, the trails are designed not to be physically straining and most of them can be walked in three hours at the longest. All of them were developed in strategic areas so as to maximize the chances of wildlife viewing, and some of them were used by researchers in their studies about the ecosystem. Visitors will go into the forest in small groups of up to six people. During the flood season (May to July), all the Reserve area gets flooded. In this period, tourists will glide through the trails in small paddle canoes. On these trails, visitors may view different species of monkeys and other arboreal mammals, such as the red howler monkeys, uakaris, squirrel monkeys and tree toed sloths. Mamirauá Institute is a Reasearch Unit linked to the Ministry of Science, Technology and Innovation of Brazil, Its researchers study mainly the biodiversity of the Mamirauá Reserve. In the area where Uacari Lodge is located there are two research stations where groups of researchers stay during their field trips. Since visitors have great interest in knowing the research carried out in Mamirauá, the lodge promotes the interaction between researchers and visitors. These researchers meet tourists at night, when they make a presentation os the study fields – usually about one of the typical animals of the Amazon. Through community visits, guests will be able to know the history, way of life and customs of this riverine population. They will be hosted by a community guide – a local person especially chosen by the community to be the host. The community guide will show the main attractions in their village, and will share with visitors the history of the place. Visitors will ask questions and will also be specially encouraged to talk about their own way of life. Mamirauá Lake is located at the heart of a total preservation zone and works as a nursery to some aquatic species. During the excursion to the lake, visitors possibly have encounters with the pink river dolphins, hoatzins and maybe the pirarucu fish. In the end of the afternoon at sunset, visitors will watch one of the most beautiful sceneries in the Reserve. On the way back to the lodge, evening animals like the black caiman – the largest predator in South America - can be seen. Imagine the sensation of sleeping in the middle of the forest in a house that is in the same height as the crown of the trees? And this house is made of a material that allows you to have a 360 degree view of everything that happens around you? That is how you will feel in a Jungle House. Together with a guide, you will spend the night with the forest, the animals and its sounds. The Uacari Jungle Lodge has five wooden floating bungalows covered by tiled roofs, including two rooms and two bathrooms, that can accommodate up to 20 guests. They each have a porch which offers a breath taking view on the surrounding Amazon Rain Forest, plunging guests into this magic environment. All decorated in a simple wood style, they offer a great space (25m²) as well as a comfortable single queen-size beds, mosquito nets and two tables. The five floating cabins are strategically located so that it is an ideal place to observe wildlife without leaving the premises. The lodge offers three meals a day, Breakfast, Lunch and Dinner. The menu was created from Brazilian cuisine, focusing on local products and dishes that are typical from the Amazon Region gastronomy. It is composed by a lot of fresh fish and regional vegetables, fruits and juices. Red meat is not served. The bar offers national and foreign wines, cachaças, beer and soda (not included). 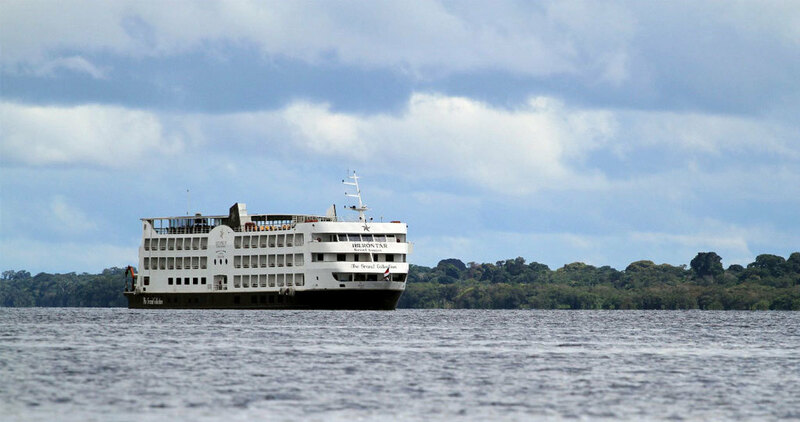 The Uacari lodge is equipped with transport infrastructure including speedboats, motorized and local typical canoes. The 40 hp engine speedboats are used in the transfer from Tefé to the lodge. Up to six guests at a time can stay on board. Please beware that you should only bring a maximum of a 15 kg baggage item. Leisure infrastructure is mainly composed by interpretation and observation trails, but the lodge also has an animal watching natural structure, built inside the forest and destined to get as close as possible from wild animals without danger. As the Lodge uses solar power, electricity is not always available. Batteries can be charged only a few hours a day, depending on the weather conditions. It is recommended to bring extra ones. There is also a VHF radio communication system (there is no telephone network).